Come celebrate SUMMER in the beautiful town of Ocean Springs, MS! If you are looking for a quiet place for some R & R on the Gulf Coast to enjoy the season, then Ocean Springs may just have that quaint little town atmosphere you are looking for! This cottage is about location, location, location!! Front beach and downtown are both within 2 & 1/2 blocks of the cottage. The weather is beautiful here, the sand and beach chairs are waiting, the grill is ready to be fired up on the back porch, Tatonut is making the best donuts ever, and the restaurants are serving up great food and music!!! This beautiful little cottage has been totally renovated from floors to ceiling and boasts a brand new fully equipped kitchen, appliances, bathrooms & fixtures along with a new stackable washer/dryer. The location is perfect for your beach vacations or weekend getaways and ready for your enjoyment and pleasure as you spend time around the beautiful and quaint town of Ocean Springs, Mississippi. You can enjoy the back porch where you can relax outside listening to birds and watching butterflies. The dining and living room give comfort and relaxation after a day at the beach, exploring downtown, or trying your luck at the casinos. The master suite has a queen bed and master bathroom that also houses the stackable washer/dryer unit. The guest room also has a queen bed and its own bathroom. 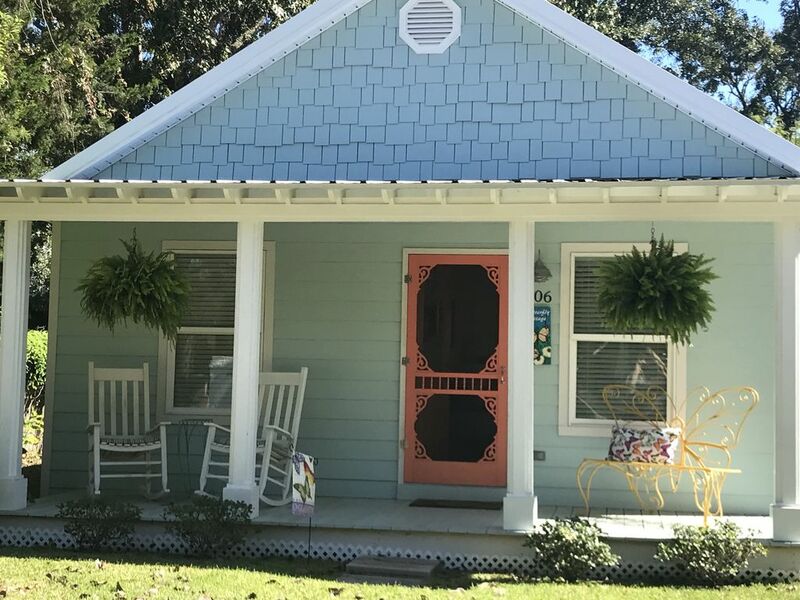 Butterfly Cottage is a private home located in a quiet neighborhood near the downtown Historic Ocean Springs. I have enjoyed getting to know our neighbors who are fun and interesting people whose friendship, privacy and quiet enjoyment of their homes and community are very important to us. Please treat our home and neighbors with the same respect you would your own. We hope you enjoy your stay. PLEASE ABSOLUTELY NO PETS AND NO SMOKING! My daughter married a long time resident of Ocean Springs. They settled into a quiet life here on the Gulf Coast this past decade and invited me to come enjoy this wonderful little town. I fell in love with the relaxed life style and warm winters, but it also is allowing me to enjoy the cultural experiences of Walter Anderson Museum, Shearwater Pottery, and the entire historic Ocean Springs community. Front Beach and Fort Maurepas Park, ONLY 2 blocks from Butterfly Cottage, are just a few of my grandsons and my favorite places to play, ride bike, and relax. And at the end of the day, walking less than 3 blocks to downtown we can enjoy some of the finest restaurants and shopping on the Gulf Coast! This cottage is easily at the center of all the activity and experiences Ocean Springs has to offer. One can easily walk to the center of town in one direction and to the beach in the opposite direction. Everything is very close and convenient. Bath towels are provided on all daily or weekly rentals. Rentals LONGER than 1 week will be offered use of cottage towels with a fee of 10/weekly or 25/monthly. Bed linens are provided on all daily or weekly rentals. Rentals longer than 1 week will be offered use of cottage linens with a fee of 25/weekly. Bath towels are provided on all daily or weekly rentals. Rentals longer than 1 week will be offered use of cottage towels with a fee of 10/weekly. fully equipped with dishes, glassware, flatware, coffee pot, toaster, crockpot, etc. The cottage was perfect for our stay in Ocean Springs. It is roomy, so comfortable, and furnished nicely. There wasn't anything we were lacking. The kitchen was well-stocked with all you would need and more! We loved the cheery décor in the kitchen and the brightness of the cottage. The bedrooms were nice and dark for sleeping. It's a great neighborhood for walking or biking and so close to either the beach or restaurants and shops or anything else this quaint town has to offer. I wouldn't hesitate to book again. The owner, Cindy, was so pleasant to deal with. I had some questions on several different occasions and she was very helpful. Oh my! My husband and I stayed for three nights and I will not look at any other place when we visit Ocean Springs. I was so impressed with the amenities and the cleanliness. The housekeeping is excellent (baseboards were clean, no dust bunnies in corners or behind the beds, refrigerator immaculate, dishes and glassware and pots were spotless, etc.) The cooling system kept the house very comfortable. We loved having a television in the master bedroom. The location is ideal, it’s close to the beach and downtown. You will not be disappointed with this cottage!! Thank you so much for your kind words! I am happy you found the cottage so welcoming and enjoyed your stay! You were awesome guests; please come back to Butterfly Cottage anytime! Thank you for your kind review! I so glad you had a good time and enjoyed Ocean Springs! Please come back for a visit anytime! We enjoyed a wonderfully relaxing weekend at the Butterfly Cottage. It was an easy walk to shops and restaurants. The cottage had all the amenities you could need. It was just the two of us, but I would definitely recommend the cottage for two couples. The layout, with bedrooms on either end with the bathrooms in the middle, would give some additional privacy. The decor is adorable. Thank you very much, Angela, for your nice review! I'm so glad you had a wonderful time in Ocean Springs. I hope that having a door to give privacy to the master suite bedroom and bathroom was good for you. I appreciate your suggestion to have another suite for the guest bedroom & bathroom. Thanks again for you thoughtful review. You are welcome back anytime! The cottage is absolutely perfect! I rented it for the weekend to attend my grandsons 1st bday. It was nice to be able to have the immediate family over for dinner on Friday night before the big party on Saturday. We ordered almost the whole menu for take out from Phoenicia Gourmet Restaurant and it was so delicious, we went back for breakfast in the morning! The cottage was very clean; equipped with everything we needed and very comfortable! I will definitely be back! Thank you so much Cindy, You're the best! Wow! Thank you so much for those kind words! My goal is to make all our guests comfortable during their stay! So happy you loved and used the kitchen! Glad you had a fabulous party for your grandson!! Thank you for treating my little winter home like your own; I appreciate you leaving the cottage in perfect condition when you checked out! Please come back anytime!! Check-in is flexible and check-out is by 10:00 am. NO PARTIES - The renter must be a least 21 years of age and other adults cannot rent property on behalf of underage guests. There will be no exception. Any special occasions or events must be disclosed at the time the reservation is made and is subject to Owner's advanced approval. Any special occasion or event that would require street parking or that would be disruptive to neighbors in any way is not permitted.